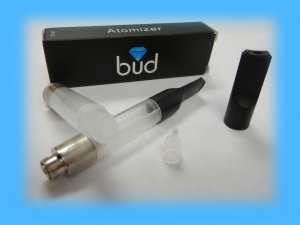 The BUD Tank Atomizer 2.2 ohm 510 – 2 Pack is a refillable cartomizers (Cartridge and atomizer rolled into one) that holds about 1.5 ml of e-liquid. I purchased them from www.vapingzone.com. They have a removable mouth piece, small plastic attachments for droppers and simple refill procedures that don’t require an entire kit. The Vaping Zone only offers USPS shipping and I hope they start offering UPS or FedEx, since I’m one that will pay the extra funds for faster shipping. First, they work great. The stoppers hold the liquid, and if you follow the instructions, there is no back-wash of e-liquid. Most importantly, no leaking of e-liquid at any point from any of the ones I’ve used. I used a lot of these and didn’t have any problems of any kind really. The flavor is great, and I only had e-burn when using VG (Vegetable Glycerin) e-liquid, because it seems you have to prime them (give a few dry puffs without battery activation) to give the atomizer time to fill with e-liquid. They have 2 models, one for PG and one for VG now. Overall, I really like these. At $5.99 for 2, they aren’t the cheapest, but so worth it in my book. The best in its size category for sure.